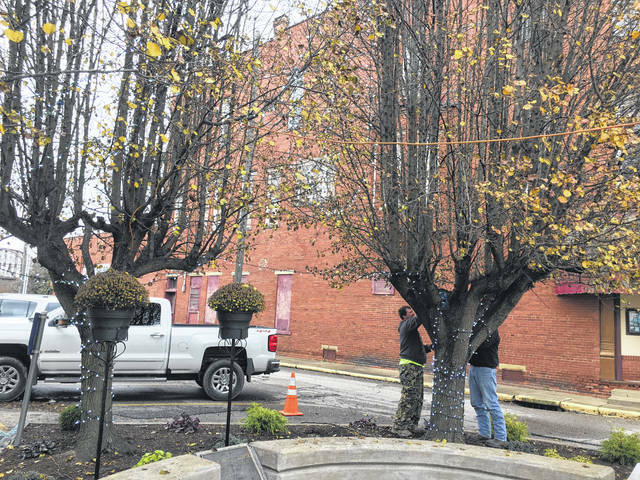 Workers from the city have begun putting up the lights on the Silver Bridge memorial trees. Mayor Brian Billings shared once all of the lights are hung, they will be lit up. 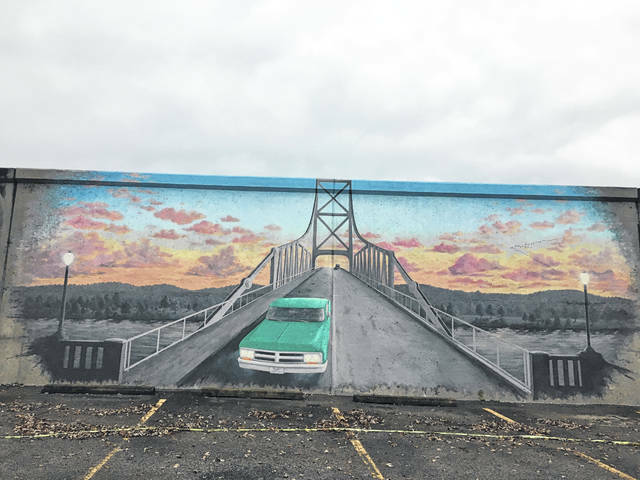 The Silver Bridge Memorial Mural, pictured, will be dedicated on the 51st anniversary of the Silver Bridge collaspe during the annual Silver Bridge Memorial Ceremony. POINT PLEASANT — For the 51st anniversary of the Silver Bridge collapse, the completed mural in memory of the Silver Bridge will be dedicated during the fourth annual Silver Bridge Memorial Ceremony. Event Organizer Kenny Grady shared this year’s Silver Bridge Memorial Ceremony is set for Saturday, Dec. 15, beginning at 5:30 p.m., on 6th Street. One portion of the ceremony will be the dedication of the Silver Bridge Memorial Mural, according to Point Pleasant Mayor Brian Billings. At the Silver Bridge ceremony last year, the 50th anniversary of the Silver Bridge collapse, Billings and Mason County Commission President Tracy Doolittle announced a mural would be placed on the flood wall at 6th Street, where the Silver Bridge entered and exited, depicting the structure. The pair unveiled an artistic rendering of the mural to the public. For the past year, members of the mural committee and many others worked together to bring life to the mural. During the mural’s dedication, the artist of the mural, Jesse Corlis, will be introduced as well as the members of the mural committee including Billings, Doolittle, and Point Pleasant River Museum Director Jack Fowler. Following, a commemorative plaque, which is placed in front of the mural, will be presented to the public. Underneath the statement, recognition is given to the City of Point Pleasant and Mason County Commission for supporting this initiative, Corlis, those who gave significant donations towards this initiative including Stantec Consulting Surfaces Incorporated, David Tarr of Holdings LLC, American Society of Civil Engineers, and West Virginia American Society of Civil Engineers, as well as the members of the mural committee. Former residents of the city also sent in smaller monetary donations to help support this initiative, which were very appreciated, said Billings. Prior to the dedication, City Inspector Randy Hall and Street Department employee Butch Bonecutter will be installing river bed rock at the bottom of the mural to help prevent individuals from parking too closely to the mural. Inside of the river bed rock there will be river pebbles added as well. In looking forward, there is a plan to add lights near the mural to add emphasis of the artwork. In the spring time, students from the Mason County Career Center and members of the Tu-Endie-Wei Garden Club will continue sprucing up the garden with the Silver Bridge memorial trees by adding more flowers and shrubbery. They began their work on the garden a few months ago. Also, the Silver Bridge historical marker is currently in Charleston being refurbished. According to Billings the company will try its best to have the marker back to the city for the Silver Bridge ceremony, but it is not guaranteed. The exact time of the mural dedication is to be announced as is the complete schedule for the ceremony. The complete schedule of the Silver Bridge Memorial Ceremony will be released in an upcoming edition of the Point Pleasant Register.